One of the most amazing things to see in the Dow Jones Industrial Average is its ability to correct and drop 170 points only to recover all the losses in the space of a single day. To the new trader, this always surprises them. Some may panic and sell their positions only to discover that if they had sit tight they would have not lost that much at all. 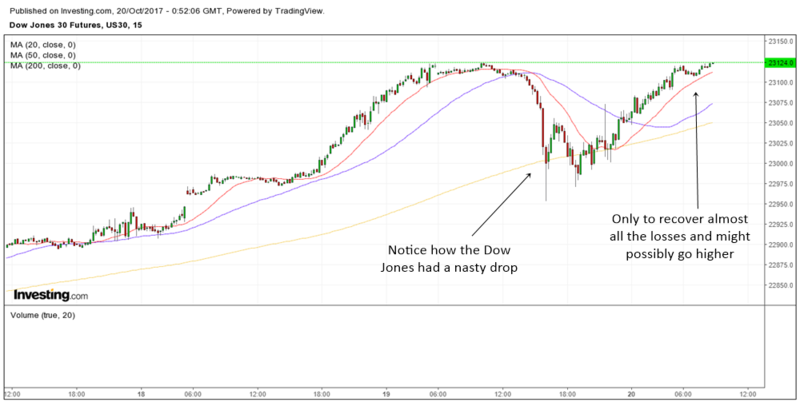 In this article, we will be looking at the intraday price movement of the Dow Jones Industrial Average Futures. This will give you a glimpse into the world of day trading and the excitement it brings. It is also a lesson in technical analysis where we will learn why the stock market behaves the way it does. To some it may be an eye opener and to some it may help you understand the stock market and the world of futures a bit more. Let's take a look at the chart below to see the extent of the drop and recovery. The chart above is the 15 min chart of the Dow Jones Industrial Average Futures. If I did not tell you that it is a 15 min chart, you would have probably thought that it was a daily chart where the Dow had a crash. As you can see, chart patterns can occur again and again in different time frames. Whether it is the monthly chart, weekly chart, daily chart, 60 min chart, 15 min chart or even the 5 min chart, market cycles will repeat itself in these time frames. So what are the different market cycles or market stages? 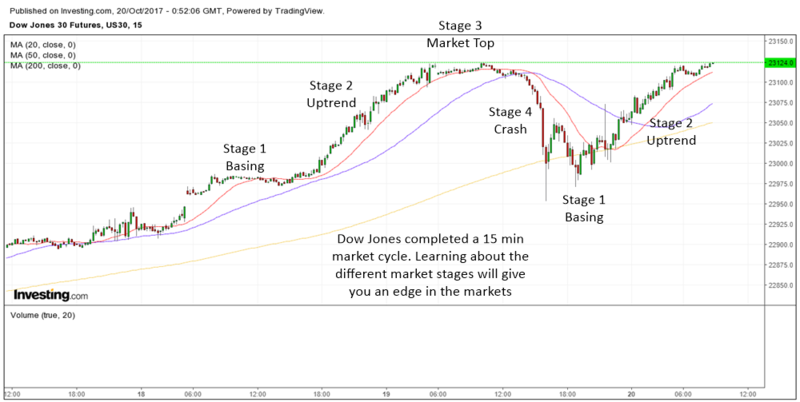 If you look at the chart above once again, you will notice that the Dow Jones Industrial Average went through Stage 1 to Stage 4 and then started a new Stage 1 and Stage 2 in a short period of time. 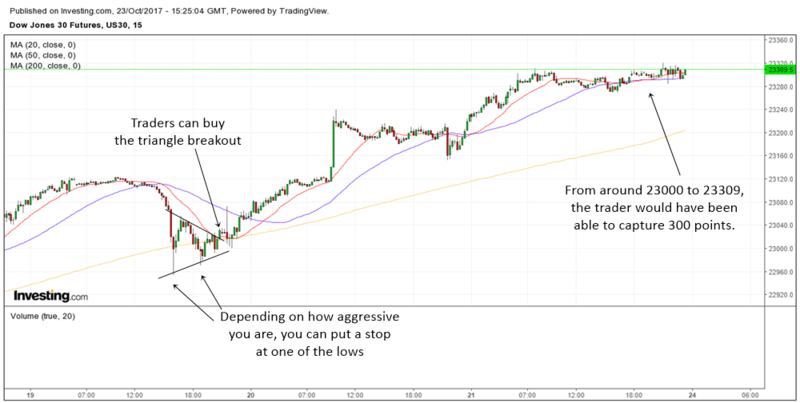 Take a look at the chart below which I have annotated. 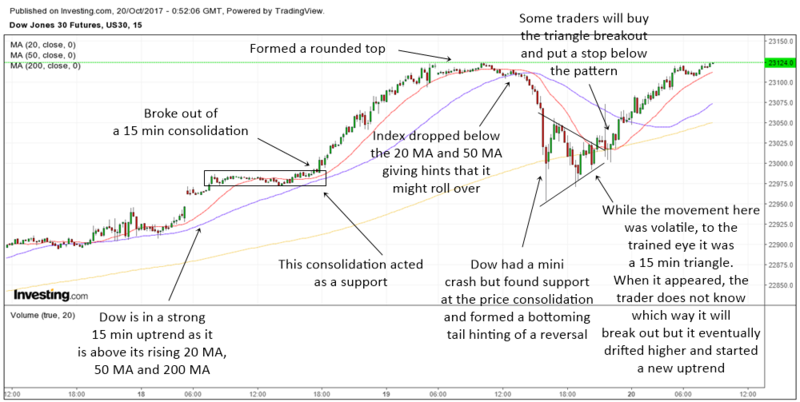 The chart above shows clearly how the Dow Jones Industrial Average completed a 15 min market cycle. If you learn about the different market stages it will give you an edge in the markets. I have written about the 4 stages of the market in another article which you might want to read if you have time. Although the chart above is a 15 min chart you can see how it goes through a complete cycle. First of all, the Dow Jones traded sideways forming a consolidation. A consolidation is also known as the basing stage or stage 1. It then broke out of the consolidation and started a new uptrend. The uptrend is known as stage 2 of the market cycle. There will come a time when the market will top out and the Dow started to lose momentum and formed a rounded top. This is known as stage 3 of the market cycle. After the appearance of the rounded top, the market started to roll over and quickly turned into a mini crash. This is known as stage 4 of the market. The Dow then started to bottom by refusing to go any lower. This was a period of violent movements but if you examine the price pattern, you will notice that it was making higher lows. This is what we call a stage 1 or bottoming process. Finally, the stock broke higher and started a brand new stage 2 uptrend. There is a reason why I showed you the 4 stages of the market first. The 4 stages of the market or the market cycle is the basic anatomy of the market. Every market index, stock, futures, commodities, forex, bonds, etfs, cryptocurrency or whatever that humans trade will go through the 4 stages of the market. These cycles appear in almost all time frames that you can imagine. Whether it is the monthly time frame or daily time frame down to the 1 min time frame. History always repeats itself in the financial markets. If you learn from history and if you master the 4 market stages, then you will be able to profit from it. You will also be on the right side of the market most of the time instead of being a hostage to the whims and fancy of the stock market. Every market index, stock, futures, commodities, forex, bonds, etfs, cryptocurrency or whatever that humans trade will go through the 4 stages of the market. History always repeats itself. The chart above is the same chart as the previous 2 charts but this time I have annotated it with some technical concepts. Let's take a look at the different technical analysis that goes through the mind of a trader. We will start from the left and then move on to the right. The Dow actually started off being in a nice 15 min uptrend. It was above its rising 20 MA, 50 MA and 200 MA. This is a sign of bullish strength. Dow consolidated for awhile. I have drawn a box over it and you can see it clearly. It broke out of the consolidation as it came near to the rising 50 MA. 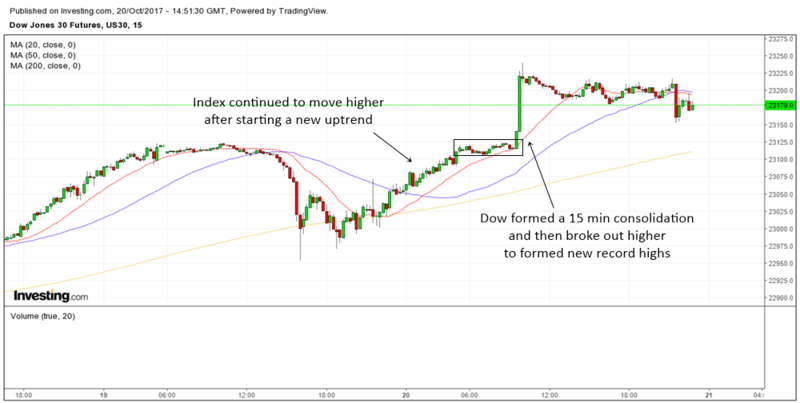 Dow started a nice 15 min uptrend that brought it to new record highs. With such a rapid rise, it was inevitable that some form of correction will happen. Many experienced traders were expecting a correction. As the bullish momentum slowed down, the Dow Jones started to tire out and formed a rounded top. Dow then begin to drop below the 15 min 20 MA and 50 MA. When the index drops below the 20 MA and 50 MA after a nice run up, it can often signal a short term top. Sure enough, the Dow started to roll over and the selling got heavier and the drop became faster. At the climax of the sell off, the Dow actually formed a very large red candle. However, Dow found support at the previous consolidation and quickly closed back up far away from its low to form what we call a bottoming tail. The bottoming tail actually marked the low of the correction. After that the index had some volatile move up and down but to the trained eye, it was actually making a triangle pattern. When the triangle formed we still do not know which way it may breakout into. However, the index started to drift upwards and then it broke out higher and started a new 15 min stage 2 uptrend. The chart above is the same 15 min chart of the Dow Jones Industrial Average fast forward. The index made a 15 min consolidation and then broke out higher to form new record highs. Wouldn't it be great if you had recognize the triangle pattern and took the appropriate steps to buy as it bottomed? Well, now that you have learned a little bit more about how indexes and stocks bottom, you will be able to spot them in the future. If you go through the Trading Course that I have written, you will also be able to spot these bottoms better in the future. Now that you have known about why Dow Jones shot up, so how do you trade it and capture 300 points? The trader who saw the triangle pattern can actually buy the triangle breakout and put a stop below the pattern. Then he or she can just ride the trend higher. I have captured another screenshot of the Dow Jones and now it is around 23300. From 23000, the Dow went up by 300 points to 23300. Congratulations on learning a bit more about the stock market. You have now learn how a stock index rise and fall and the reason behind them from a technical point of view. One great thing about the stock market is that history always repeats itself again and again. Therefore, if you learn as much as possible about chart patterns and market cycles, you will be able to take advantage of this knowledge and profit in the future.